This is the kind of unbiased communication I like! Really happy to be a PGH investor ! PGH since 8/05 performance is more than miserable! Exactly when it supposed to have a “good” one… sorry all, I’m so said (as all my investors), because I’m also losing on my accounts…. I invest generally (in my accounts…) on civil year basis, in this terms, imagine I have 10k to invest, I keep 9k in a bank to a +1,5% and invest 1k in forex. If keep all 10k on bank at end of year I will have won 150$. With that 1k I admit to lose maximum 40% and fight to win 60%. If I lose those 40% I will have in my account +135$ + 9000$+ 600$ = 9735$ (instead of winning for sure 150$ I risk to lose 265$ (- 2,65%). If I win 60% I will have +135$ + 9000$+1000$+600$ = 10735$ (+ 7,35%) this is what I call return above average with minimum possible risk ( and my numbers have been above 2 digits profit for considerable years)…. 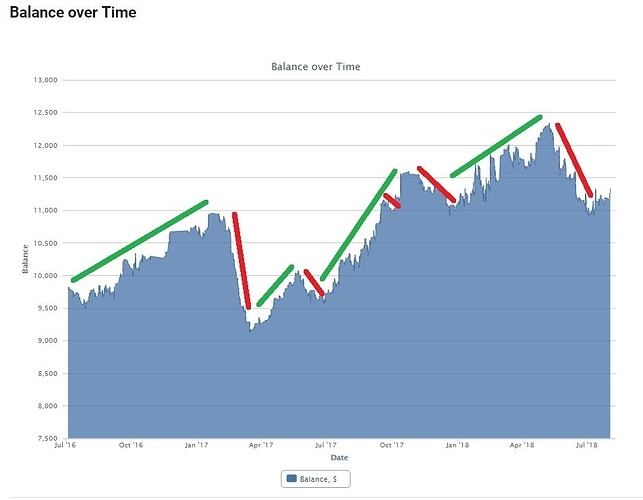 I normally made this with more money and calculate with what I have available for 3 years cycle, but same “rules”… so invest in “me” for 1M,3M are perfectly random, could be good or bad…. Taking this in consideration invest in PGH during 8M and winning 22% is very good, what I not recommend for an investor on a trader like me ( 100% dependent and “on” markets… and trading for average yearly returns…) is increasing the investment 350% and closing it in 2M losing 9% ( more money than have been wining in 8M). very nice "improvements" (several!) from Darwinex last times, in my opinion, congratulations! awesome to "see" / analyse / etc! although a very miserable first semester on 2018, one of worsts ever! (for me as trader.... and for my investors), special because it is worst then first semester of 2017 what makes me very sad, and sincerely i do not expect... but it's the game at is hardest times ( for me...). If you keep your promise you will have success @ Darwinex! PGH is one of the few gainers of July in my portfolio. A disciplined recovery, nice job! good I'm glad. the markets have been difficult to launch positive deals ... many sudden changes due to Trump tweets ... (LOL), and the system is forced to reverse many negative trades ... but one little bird tell-me that "something" important that will change last months behavior will happen soon..
taking in consideration my post https://community.darwinex.com/t/cavaliereverdes-live-portfolio/2341/379 i received one email from one darwinex "investor" asking me what i consider essential in a trader or investor.... not easy... i have answer him with words from something i read in 2009.... ( not a very good site like many others, and long time ago... LOL) but this simple words means all and is all that maters to be successful trader and/or investor ( of course that what successful is also different for any of us...) i decide to let that words here... maybe they can be useful for someone... and for sure, with any strategies if you put them to work you will archive your "successful..."